Always dreamed of making the big jump? 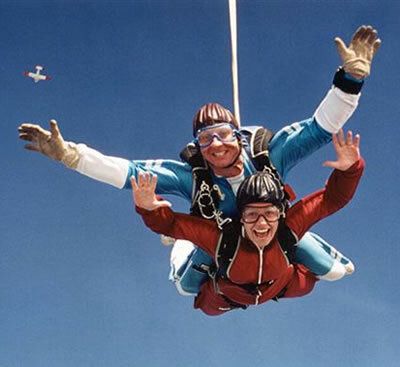 Experience this amazing sensation by taking a Tandem Parachute Jump - Accessible to everyone with only 15 minutes preparation on the ground. Your tandem pilot looks after all the details leaving you free to experience the exhilaration of the jump. 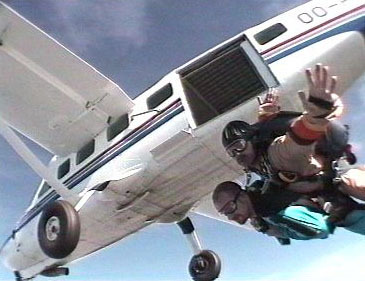 The tandem pilots are among the most experienced in the world. 20 minutes after take off, at an altitude of between 3000m & 4000m depending on the type of plane, you jump & free fall for about 30 - 50 seconds at a speed of 200km/h : you will discover unbelievable sensations. The cost of the jump: 210€ per person during the week / 225€ per person on weekends & bank holidays. Capture your experience for a life time - For a special occasion, your hen or stag weekend, birthday or special holiday with friends or family. You can have your jump filmed on DVD and an optional CD of photos. You can book your cameraman on the ground before you take off. 89€ for your DVD plus an optional 30€ for your photos on CD.